Kirovohrad is the capital of Kirovohrad region (oblast). Kirovohrad oblast was formed in its contemporary borders in 1939. Its territory is 24,600 sq. km which makes 4.1% of the total territory of Ukraine, with the population of 1,168,500 people, which is 2.4% of that in Ukraine. The average population density is 48 persons/sq. km, against 83 persons/sq. km in the country as a whole. The oblast includes 21 administrative rayons, 12 towns, 4 of them being those of regional subordination, 26 urban-type settlements and 1024 rural-type settlements. The urban population makes 61,2% of its total number in the region, against 67,9% in Ukraine. Above 30 ethnic groups are represented in the oblast: Ukrainians 85.3%, Russians 11.7%, and others. The Kirovohrad region is situated in the center of Ukraine, in the Dnieper and the Southern Buh interfluve. 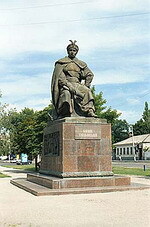 A marker of the geographical center of Ukraine was put in the Dobrovelychkivka rayon. The settlement of the region started in the age of paleolith. In the second half of the 15th century these territories were a part of the lands where the Zaporizhzhya Cossacks appeared. Later, for nearly three centuries these lands were a part of the "Volnist (the Territory) of Zaporizhzhya Army". It was here that the Cossacks worked and fought. the town of Elisavetgrad (now Kirovohrad) – an uyezd (rayon) central town in Kherson guberniya (province). The temperate warm climate, the availability of deposits of radon and mineral waters (reserves of about 150,000 cu. m /year), forest areas, meadows, and rivers create favorable conditions for organization of short- and long-term recreation as well as a network of resort-therapeutical establishments. tungsten, copper, molybdenum, apatite, uranium, gold and silver, bismuth, tin, lead, beryllium, antimony, tantalum and niobium, is the characteristic feature of the Kirovohrad metallogenic zone. The mineral and raw material potential of the region includes above 340 deposits of minerals, 107 of them being developed. These are: brown coal, ore raw materials, raw materials for nuclear power industry (uranium), non-ore minerals. The main amount of minerals is excavated from open mines which creates favorable conditions for development of the mining sector in the region. The gold ore deposits, discovered in the recent decades, are the basis for the future creation of gold mining and gold-processing sector in the region. According to geologists’ opinion, the deposits of platinum, diamonds, chrome, tungsten and rare metals may be discovered as well. The Kirovohrad region is known since long ago as a region with well-developed agricultural production. The natural-climatic conditions and rich black soils (chernozems) are favorable for growing agricultural crops. A set of organizational, agro-forest-reclamation, hydrotechnical and other measures have been taken with the purpose of rational use of the land resources. The oblast farming (as of January 1, 2000) includes 492 collective agricultural farms, 12 state farms, 25 interfarm enterprises and 1921 private farms. Pursuant to the Presidential Decree "On the exigent measures targeted at acceleration of agricultural reforms in the oblast", reforms of collective agricultural enterprises are under way. On the basis of such enterprises, agricultural production cooperatives, agricultural associations, private lease enterprises and farms are established. Plant-growing, which accounts for 59% of the agricultural production, and cattle-breeding accounting for 41%, occupy the leading position in the branch structure of agricultural gross output. The total area of agricultural lands is 2,000,000 ha (4.9% of the total area of agricultural lands in Ukraine), including arable lands of 1,800,000 ha (5.3% of such lands in Ukraine). The winter wheat, barley, maize for grain, leguminous plants, buckwheat and oats are main grain crops grown in the region. The sunflower and sugar beet occupy a significant place among technological cultures. Gardening is characterized by growing apples, pears, plums, cherries and berries. Cattle-breeding is based on livestock, hog and sheep farming. The oblast’s industry embraces 13 leading sectors which include 274 industrial enterprises. In 1999, in the structure of the gross output of industrial production the branches of industry made: food industry 37.0%, machine building and metal working 17.7%, power engineering 14.7%, construction materials 6.1%, fuel industry 4.5%, light industry 2.2%, and non-ferrous metallurgy 0.8%. In the goods market of Ukraine the region is distinguished by production of sowing machines and grain combines, electric traveling cranes, brown-coal briquettes, nickel, graphite, ozocerite, etc. Due to the agricultural specialization of the oblast, machine-building is targeted at providing the agriculture and processing industry with the necessary machinery and spare parts. In order to promote the further development of agricultural machinery-building, a concern "Lan" was established incorporating both scientific and productive potential of the oblast. There are unique complexes for nickel and graphite extraction and production in the oblast. These are: OJSCs "Pobuzky Ferronickel Plant" and "Zavallivsky Graphite Integrated Works". The oblast provides 100% of brown coal mining of the state. This sector is represented by the state holding company "Olexandriavugillya". In compliance with an international agreement, in the town of Dolynska the construction is under way of the Kryvyi Rih mining and processing integrated works of oxidized ores with a yearly capacity of 26,0 million tons of crude iron ore, about 11 million tons of concentrate and 10,0 million tons of rolled briquette. The oblast is favorably located geographically and has a developed transportation network. The Kirovohrad region is crossed by main railroads for transportation in the Donbas-Carpathians direction linking the important industrial and agricultural regions of the South with the South-West and the Center of Ukraine. The transport network includes 926 km of railways. The network density is 38 km per 1000 sq. km. The Kirovohrad region has 10 highways 728.7 km long in convenient directions, which link Ukraine with the countries of the CIS and Central and Southern Europe. The motor roads density is 308.5 km per 1000 sq. km. The Kirovohrad airport corresponds to the 3rd category of ICAO. Transportation by air is performed by the state air carrier "Ukrainian Airlines". There are two commercial air carriers: "URGA" and "Chaika", working on international air lines. Public communications services are rendered by the regional enterprise of communications "Kirovohradtelecom" having 12 offices and 10 departments as well as the regional enterprise of mail communications "Kirovohradposhta". The Kirovohrad inhabitants were among the first telephone subscribers in Ukraine who could communicate with the whole world. Automatic trunk-exchange 5 ESS ("Utel") for long-distance calls was put in operation in 1994. A new kind of communications services - cellular or mobile telephone communications - was introduced in May 1996. Kirovohrad oblast has its glorious cultural traditions. I. Tobilevich, the founder of Ukrainian realist theatre, was born and worked there; the great actors M. Kropivnitsky, M. Sadovsky, M. Zankovetska lived and worked there as well. Well-known writers D. Bedny, I. Mykytenko, V. Vynnychenko, Yu. Yanovsky, scientist D. Chyzhevsky, composers G. Neihaus and Yu. Meitus, famous artists A. Osmyorkin and V. Fedorov, famous Ukrainian drama figures I. Maryanenko and G.Yura were born here as well. Kirovohrad oblast is reach in folk art. The oblast’s pride is the "Zoryany" theater of folk music, song and dance of the oblast’s philharmonic society, children’s exemplary choreographic ensemble "Prolisok" of the Kirovohrad school of arts, distinguished amateur dance ensemble "Yatran", Kirovohrad municipal choir and many others. The annual festival of professional and amateur drama "Veresnevi Samotsvity" ("September Gems") which is traditionally held on the premises of the memorial museum of Ivan Karpenko-Karyi (Tobilevich) – the "Nadiya" farm – is a real feast of the national culture.